It is probably fair to say that none of us feels that our family is just like the Holy Family. Jesus, Mary and Joseph can at first seem to be too unreachable an ideal for our own family. Perhaps, especially at this time of the year, we are most intensely aware of the limitations of our family - of the various families we are a part of. Selfishness, stubbornness, independence can appear to be so great that we can question the integrity of our family as a family, let alone see any real holiness there. How holy can my own family be? 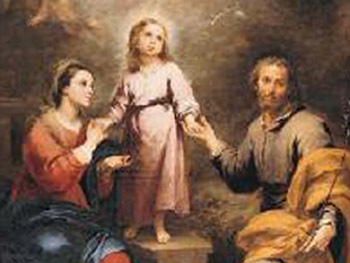 What help can a reflection upon the Holy Family have for me today?. The first thing to consider is to humbly acknowledge the humanity of our family - including my own humanity and that of everyone in the group. Human beings are capable of great things, but every human being is capable of great selfishness. This kind of acknowledgement isn't an acceptance of the behavior or dynamics of my family as good, or even that all of it should be tolerated. This first step is a step away from denial. We can't cope with what we don't even admit is there. The second step is to acknowledge that each person in the family is seeing things, and responding to them, from his or her own perspective. Nobody really wakes up in the morning and says, "How can I be selfish and difficult for everyone today?" We all are choosing something that seems to us to be good - perhaps good for me and not for you - but my choice is for something I see as good. This acknowledgement isn't very inspiring, but it can be helpful if it leads us to a growing understanding of what each of us in our family are looking for. Real understanding can lead to real compassion. Maybe someone in the family is like a barking dog or a self-absorbed princess or is into self-protective control by not investing in conversation or self revelation or even simple help around the house. The more we see what is going on the more easy it will be to try to see it with compassion. What fear is at work here? Dogs bark when they are afraid. Self-absorbsion and passive-aggression are so often rooted in fearful self-protection. Once we can see the underlying needs or hurts that seem to be shaping our behaviors, we can more easily love those family members. Love is what will heal us. Love will make us stronger. Love will lead to greater gratitude. And grateful people can more easily notice the needs of others and love them. Contemplating Jesus, Mary and Joseph at this time of the year can help us. 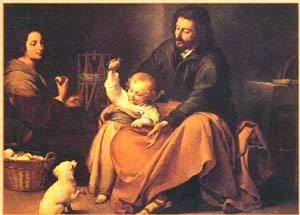 Joseph had to be so afraid when he was told Mary would be with child. The one thing he knew for certain is that he was not the father. Just imagine the temptation to judge Mary! But, Joseph believed and trusted. He accepted the role of servant. He took Mary as his wife, accepting the shame and embarrassment that the people of their village must have placed on him. Mary couldn't have fully understood God's plan for her or for her son. But she believed and trusted. She accepted the role of servant. Their child, Jesus, became the Servant of God's mission in our world. How can our family become more holy? Through compassionate love and growing trust in God, so much which leads to tension, ongoing stress and outright conflict can be healed. St. Ignatius tells us that Love is a mutual exchange of gifts. The lover gives gifts to the loved one and the loved one becomes a lover in giving gifts to the beloved. Ignatius also says that Love is expressed in deeds rather than in words. So, in these days ahead, let us give gifts of understanding, compassion and healing love to each member of our family. Let's listen, pay attention, acknowledge gifts and affirm them. Some things very holy will be affirmed. Let us find gestures, acts of kindness, time and support to give each other. Let us model for our children how to think of each other's needs first. Every step we make in this direction of greater healing and love will help our family grow in holiness. How holy can we become? The real answer is that we can become as holy as we free each other to become. In this environment of openness to God's grace, God can do more than we can ask or imagine. And, like the Holy Family, we can be living witnesses, that "nothing is impossible with God." (Luke 2).